Filed to: ¿Comebacks?Filed to: ¿Comebacks? 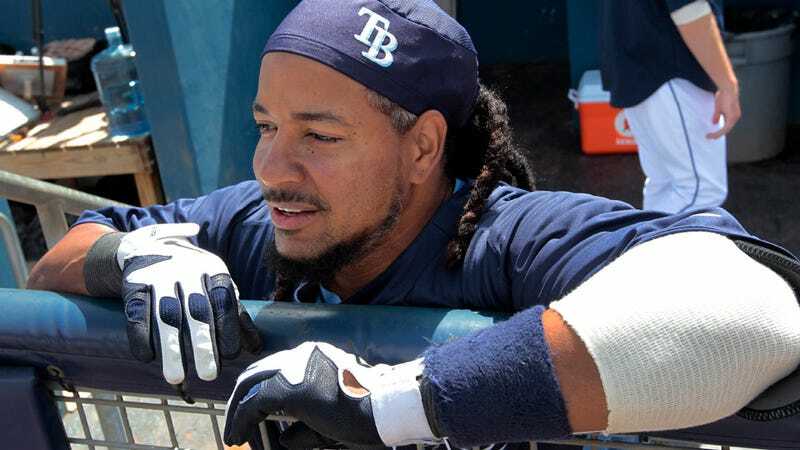 Perhaps you thought Manny Ramirez had faded away into that flickering twilight, where we'd reminisce about what a truly spectacular athlete he was. Some folks, Joe Posnanski foremost among them, would argue for Manny's Hall of Fame credentials, while others would want him nowhere near Cooperstown. "Now I'm getting ready to defend the 21st crown of the Aguilas," Ramirez told ESPNdeportes.com on Thursday. "Tell the fans to not despair because winter ball is coming soon," said Ramirez in a message four days after his sudden retirement from baseball. However, Ramirez has not made any arrangements yet to play Caribbean baseball. "We have not had any direct contact with Manny, but for us it would be great if he comes back so that the Dominican fans can see him before his definite retirement from baseball," said Luichy Sanchez from the office of baseball operations of the Aguilas. "I bought a truck and a fishing rod. Now you'll find me buying worms to relax my hands by going fishing." Aw, Manny. We didn't really miss you, but here you are again. Three weeks later. Like you never left. Wait, you didn't really leave, did you?